It's Lovely! I'll Take It! : Your choice! Do you want a pool? We have a pool! Look it's a pool. 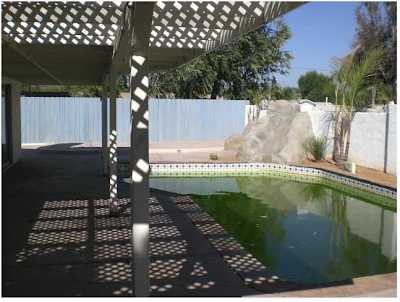 Or... if you don't want the pool... Look! We have a fishpond! Whichever you want! Note how much more full the foliage on the pondside palms is. Ah, the decisions one must make - swimability or foliage. Sigh. Thanks for the site, it's a riot. That just made by jaw drop! Urgh! That is nasty!!! And what's the big rocky looking thing?! What condition is the pool in now? Is it still icky looking or clean? Which is the current picture? Why don't people ever clean there pool? WHY WHY WHY WHY WHY?! I think the rocky-looking thing is supposed to be a waterfall, but it's turned off. Thank god it's turned off. o_o Can you imagine the slow sludge? 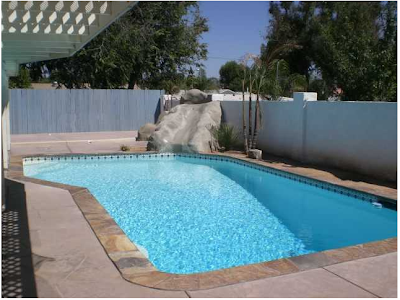 Although, usually waterfalls are the outlet of the pool filter which is also obviously not on -- maybe it SHOULD be on! Somebody can't take a ribbing. I can't get onto the listing site due to a 404 Error. The green in the second picture is a reflection of the trees, not algae. The surface of the water is more oblique in the second picture and the sun is coming from another angle. It looks like algae, though, so it's a bad thing to have on there. There is another shot of the 'waterfall' showing an edge of the pool. And there isn't enough foliage around to reflect into the pool. Our pool was NEVER that color when we had a hillside of greenery above it, as well as IN it! Also the scum around the edge of the water is NOT there in the earlier picture when the pool was clean! But I can SEE the leaves and branches very clearly and the blue sky between them. And the trees are above and to the left - you can see the trunks. It might be your monitor, Charlene. What color is the reflected rock in the second photo? It's green when I look at it -- because the water is green. It is greener in the bits that are reflections of trees, though. The rock thin is a slide. you can see the steps in another pic. I wouldn't want to slide into that tho! That funny little slide thing... Brrr. Gnome King's minion or what? You can indeed see reflections in the "fish pond," but that's not what's making it green--note that the "blue sky" area is still damn verdant, and that it's leaving green marks along the pool wall. Bill Murray to Chevy Chase in Caddyshack. Murray: You have a pool over at your place, right? Chase: Yeah, a pool and a pond, the pond would be good for you. Notice that the palm thing beside the pool is looking sickly in the top picture, and doing very well in the second... so, is there any link between that and the pool going green? I was thinking of the same thing as my aboved poster. oh, charming. I'll take the fishpond. Time for photography lessons - "Lighting 101."